Fox Pest Control is the #1 Rochester pest control & extermination company. We have over 22 years experience, and have helped over 40,000 homeowners and businesses with termite extermination and other pest control. Read on to learn why we are the top choice for pest control in Rochester, then pick up the phone and call us for same day help with your pest problems. Appearance - It is common to mistake termites for winged ants, so it's important to note the difference. Ants have narrow, wasp-like waists; termites have wide waists. Also, a termite's wings are about much larger, almost twice the length of its body. If you find wings, droppings or mud tubes, then call your local Rochester termite control technician immediately for professional termite treatment. 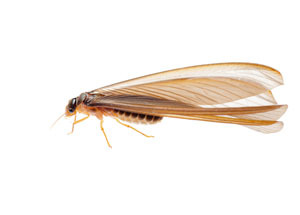 Behavior - Termites lose their wings soon after finding a new colony site; thus, if you spot termite wings on your property in Rochester, then there is a high probability that an underground nest is likely to be underway nearby. Termite problems in Rochester are not to be taken lightly. Termites do more damage to homes than all natural disasters combined; they can cause significant, expensive damage to Rochester homes and businesses in an extremely short period. Putting off calling a professional will cause the termite infestations to spiral out of control. At first sight of signs of an infestation, experienced local Rochester termite control professionals should be contacted to treat current termite issues and prevent further problems.